The Arvigo Techniques of Maya Abdominal Therapy® are founded on the ancient Maya technique of abdominal massage which is an external non-invasive manipulation that re-positions internal organs that have shifted, thereby restoring the flow of blood, lymph, nerves and qi (chu’lel in Maya). Based on over thirty years of training in massage, naprapathy, herbology and spiritual healing. Dr. Rosita Arvigo developed these techniques which now bear her name. This modality incorporates a holistic approach to health care which includes massage, anatomy and physiology, herbology, nutrition and emotional and spiritual healing. Dr. Rosita believes that with any natural healing technique, these areas must be simultaneously addressed to promote optimal health. 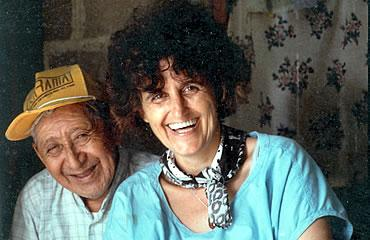 Dr Rosita learned these techniques from her mentor, Don Elijo Panti, the great Mayan shaman of Belize, Central America, with whom she apprenticed for thirteen years. Their story can be read in her book, Sastun: My Apprentice with a Maya Healer. Don Elijo believed that a woman’s center is her uterus, “if a woman’s uterus is out of balance, so is she,” he would say. Midwives and healers of Central America agree that most female problems are caused by the wandering womb. Don Elijo passed away in 1996 at 103. Dr. Rosita also studied with Hortence Robinson, a famous herbal midwife from Belize, who delivered her first baby when she was 13 years old. Hortence traveled and taught with Rosita for many years. The Arvigo Techniques of Maya Abdominal Therapy® address position and health of the pelvic and abdominal organs. The work is best known for the correction of prolapse, fallen, or tilted uterus and for the prevention and treatment of benign prostate enlargement in men and the relief of many common digestive disorders.